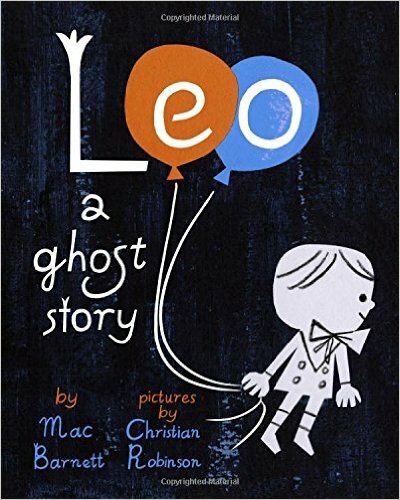 Leo: A Ghost Story is Mac Barnett's fourteenth picture book (two of which have won the Caldecott Honor Medal) in six years. That might seem like a lot for an author/illustrator, but not necessarily for a picture book author. While I tend to prefer picture books where the author is also the illustrator, Barnett's books are favorites of mine and I love seeing his unique story telling style brought to life on the page by a stellar roster of illustrators. 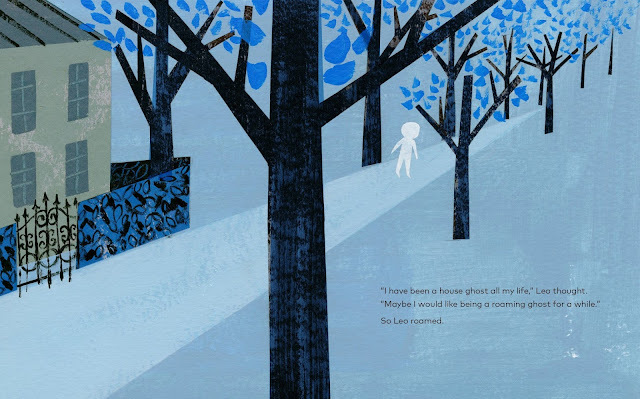 Leo: A Ghost Story is Barnett's first book with the fabulous new(ish) illustrator Christian Robinson and they are perfectly paired here. "But you can. Leo is a ghost." I love how the text immediately includes the reader in the story in an exciting, almost conspiratorial sort of way while also assuring, with the illustration, that Leo is a friendly ghost. To further reassure readers, we learn that Leo lived for many years in an empty house, reading books and drawing pictures in the dust. When a family finally moves in, Leo excitedly plays host, bringing them mint tea and honey toast. The family does not offer Leo a similarly warm welcome. After hiding in the bathtub, they call in a "a scientist, a clergyman, and a psychic" to deal with the ghost. Seeing that he is not wanted, Leo decides to end his years as a house ghost and become a roaming ghost. Already exciting, Leo: A Ghost Story gets even more so when Leo meets Jane as he wanders the city. Creating Camelot with sidewalk chalk, Jane invites Leo to play Knights of the Round Table and a fast friendship begins. Leo is knighted and introduced to Jane's imaginary friends, in a scene that is sweetly funny. Another charming passage comes when it's time for bed and Jane sets Leo up with a blanket and pillow, telling him in confidence that he is her "best imaginary friend." When a "sneak thief" enters the story, Leo makes a wise and brave choice that reveals his true identity, which could lead to more roaming. But Jane is as generous and accepting as she is imaginative and the story ends with mint tea and honey toast at midnight. 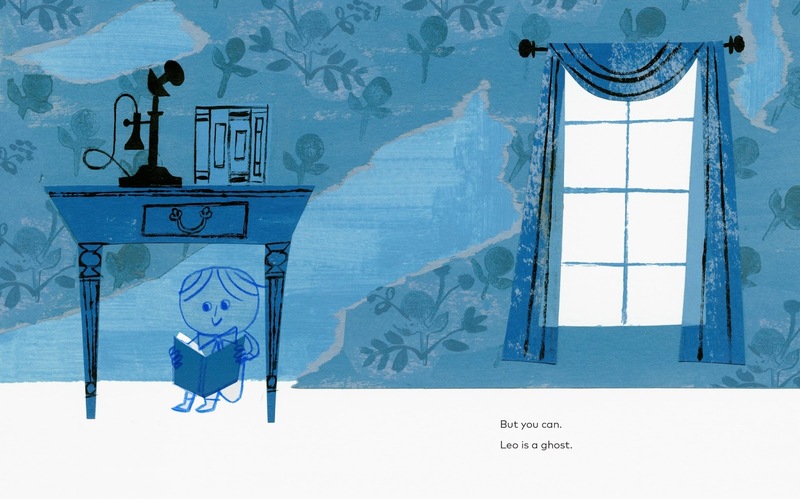 And, although it is a different house that Leo finds himself in and no longer alone, the final page of Leo: A Ghost Story mirrors with an interior that is seemingly empty. Christian Robinson's illustrations have a vintage, two dimensional feel that, with the cool blue color palette, keeps the story from being too knowing or sentimental while at the same time a little bit spooky and mysterious. The words and pictures together tell an enchanting tale that will linger in the memories of all who read (or hear) it.